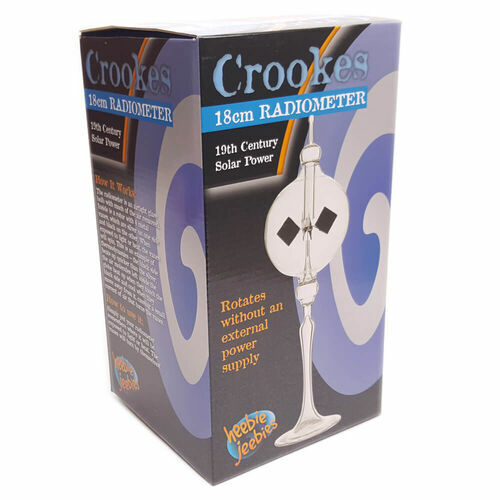 Crooke's Radiometer | Sunlight causes the sails to spin by themselves! A great example of thermodynamics! All the way back in 1873, chemist Sir William Crookes noticed that the sunlight shining on his balance scale was disturbing some of the chemical samples he was weighing. 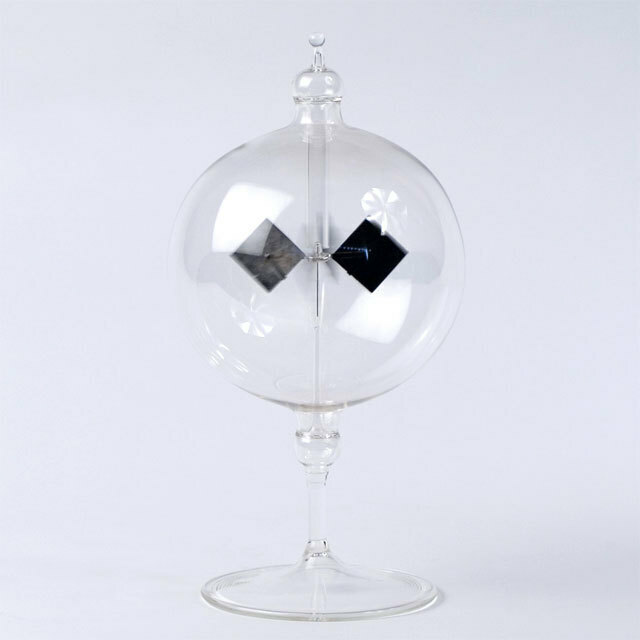 Furrowing his brow, a bit of investigation led him to the invention of the Radiometer, an easy to use example of a heat engine as the by-product of chemical research! So how does the Radiometer work? Well, your Radiometer consists of an airtight glass bulb with much of the air removed. Inside the bulb is a rotor with 4 metal vanes, which are silver on one side, and black on the other. When exposed to heat or light, the vanes will begin to spin. This is an example of thermodynamics! You see, the black side of the vanes heats up quicker than the silver, the air molecules left inside the globe heat up when they touch the black side, and cool when they move away from it. This causes a small current of air that turn the vanes, making them spin. So set your Radiometer somewhere where it will be exposed to light or heat, then watch the vanes turn by themselves! At 18cm tall, your Radiometer rotor will spin continuously up to 3,000 RPM! This is not a toy, made of glass. I was delighted by the prompt fulfilling of my recent order of a Crook's Radiometer from CoolThings. It was well packed and came in quick time. Thank you CoolTHings!